Sixteen school children from across Enfield came to Middlesex University this week to battle it out in a robot building competition. 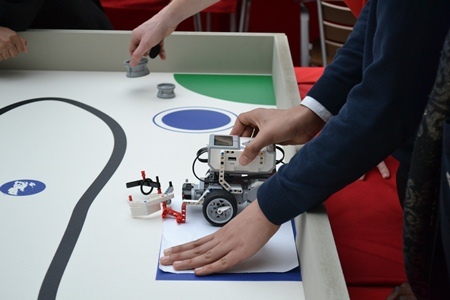 The event, which took place on Thursday 26 February, saw the year 10 pupils pair up and work closely with Middlesex University academics in the robotics laboratory to programme their machines, before later battling it out on the arena table to see which bot came out on top. Middlesex University Technical Tutor Michael Heeney, who led the day's events, said: "This is a great way of making science and engineering exciting to the younger generation. It's a rare chance for the students to put the skills they have learned to practise in a fun and creative environment. "There was a real competitive spirit in the air throughout the day, which certainly spurred the groups on." The event formed part of the Enfield Council Mayor's Award for Science, which sees gifted and talented students taking part in a series of competitive science and engineering activities. Councillor Ayfer Orhan, Enfield Council's Cabinet member for Schools & Children's Services, said: "This competition is stretching the knowledge and ingenuity of our young people. It not only shows how much they have learned but is also an excellent starting point for them to develop further in scientific and engineering fields that are becoming increasingly important to our lives. "They have had a lot of fun with a serious purpose and I am delighted that we have been able to continue to partner with Middlesex University as part of the event." The 14-15 year olds taking part in the event came from Nightingale Academy, Lea Valley High School, Bishop Stopford's School, Edmonton County School, Broomfield School, St Ignatius School, Winchmore School, The Latymer School and St Anne's Catholic High School.